Luke Beaulieu, 57, of Saint David is in critical condition after his 2006 Arctic Cat (photo) struck a tree in Madawaska Wednesday night. 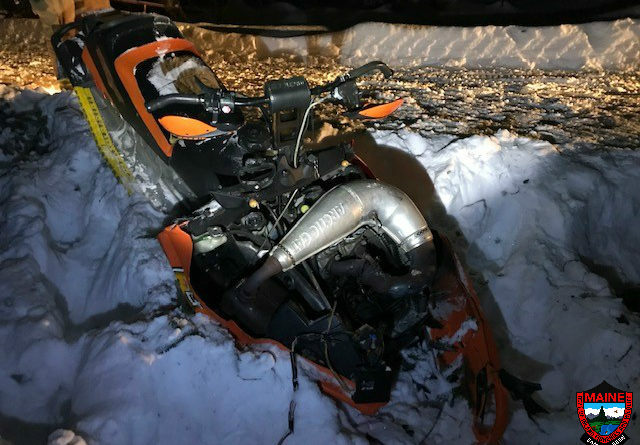 A Saint David man is being treated at a Bangor hospital for serious injuries suffered in a snowmobile crash Wednesday night in Madawaska. Luke Beaulieu, 57, of Saint David was riding his 2006 Arctic Cat off the Gagnon Road in Madawaska about 11 p.m. when he collided with a tree, according to Cpl. John MacDonald, spokesman for the Maine Warden Service. Beaulieu suffered serious injuries when he was thrown from the snowmobile, according to MacDonald. Rescue personnel first transported Beaulieu to Northern Maine Medical Center in Fort Kent, but then transferred him to Northern Light Eastern Maine Medical Center in Bangor, where he remains in critical condition. Wardens reported that speed and alcohol are likely contributing factors.